AUSTIN, Sir HORATIO THOMAS, naval officer and Arctic explorer; b. 1801 in England, son of an official in the Chatham Dockyard; d. 16 Nov. 1865 in London, England. 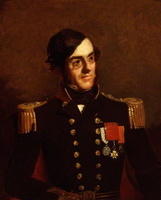 Horatio Thomas Austin joined the Royal Navy on 8 April 1813 as a second class volunteer. In April 1814 he joined the Ramillies, which was engaged in the attacks on Washington, Baltimore, and New Orleans in the War of 1812–14. For the next nine years, until January 1824, he served off the coast of Africa, in the English Channel, and on the South American station. He was promoted lieutenant on 9 Sept. 1822. 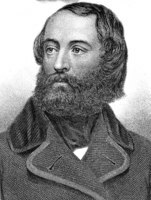 In May 1824 he set out on Fury in William Edward Parry*’s third northwest passage expedition, which sailed by way of Lancaster Sound and wintered in Prince Regent Inlet. In August 1825 Fury was wrecked off the coast of Somerset Island, and Parry was obliged to return home on his other ship, Hecla. In December 1827 Austin was appointed to another scientific exploring expedition, under Captain Henry Foster on Chanticleer, bound for the Caribbean, the South Atlantic, and the Antarctic. When Foster drowned in February 1831, Austin became acting commander. 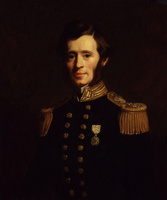 His promotion to commander was confirmed on 26 May 1831, soon after the ship’s return to England. On 8 Nov. 1831 he married Ann Eliza Rawlinson (née Hawkins); it appears that they had children, but nothing is known of them. From November 1832 to November 1837 Austin commanded in European waters, then for the next two years undertook research on the use of steam vessels in the navy. On 28 June 1838 he was promoted captain. 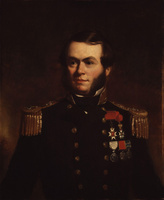 From 1840 to 1843 he commanded Cyclops during the Syrian War (he was nominated a cb for his conduct), and off the Irish coast. 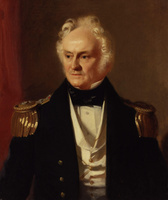 He was involved in further work connected with steamers until he took charge of Woolwich Dockyard in December 1849. 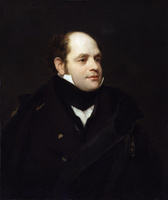 At about this time, England’s interest was focused on the Canadian Arctic, where Sir John Franklin*’s northwest passage expedition had been missing since 1845. When James Clark Ross’ searching expedition returned unsuccessful in autumn 1849, the Admiralty planned an ambitious new expedition, with two sailing vessels, Resolute and Assistance, and two screw steamers, Pioneer and Intrepid. The use of steamers in ice was an experiment, and Austin’s extensive experience with such vessels is perhaps an important reason why he was appointed on 28 Feb. 1850 to lead the expedition. Austin took command of Resolute, Captain Erasmus Ommanney of Assistance, and Lieutenants Sherard Osborn* and John Bertie Cator of Pioneer and Intrepid. The fleet sailed on 3 May 1850 with orders to search Wellington Channel and in the region of Cape Walker. Resolute was detained by ice off Lancaster Sound, but Ommanney took Assistance and Intrepid into the sound and on 23 August discovered the first traces of Franklin’s expedition at Cape Riley and Beechey Island. Austin joined him on 28 August, and they resumed their journey westward. However, they were soon beset by ice and had to winter in Barrow Strait. Three other ships sent out that year, Lady Franklin and Sophia, commanded by William Penny*, and Felix, by Sir John Ross*, wintered close by. They maintained communications with Austin’s ships, and the three expeditions shared the search by sledge in spring 1851: Austin undertook to search to the west and south, Penny to examine Wellington Channel. These sledging expeditions were undoubtedly the greatest triumph of Austin’s voyage. They were extremely well planned, and they confirmed the practicability of man-hauling as a means of exploring the Arctic and of covering great distances in comparative safety. Austin did not himself take part, but must be given some credit for organization. His men undertook six major journeys and many smaller ones; they made extensive discoveries along the coasts of Bathurst, Byam Martin, Melville, and Prince of Wales islands, and surveyed the smaller islands in Barrow Strait, but they found no further trace of Franklin. The ships were released on 8 Aug. 1851 and, soon after, all three expeditions headed back to England. There was widespread disappointment at the early and unsuccessful return in September of both Austin’s and Penny’s expeditions. The Admiralty appointed an Arctic Committee of five naval veterans to report on the conduct of the two commanders. Their inquiry revealed a quarrelsome relationship between Austin and Penny for much of the voyage, leading to a foolish misunderstanding on 11 Aug. 1851 during discussion of further search up Wellington Channel; after it they had departed for home without further ado. Austin maintained afterwards that they had agreed to return home; Penny claimed that he had wanted to search beyond Wellington Channel with one of Austin’s steamers but that Austin had refused. The Arctic Committee cleared both men and found their return justified, but neither escaped with his reputation unscathed. The committee clearly considered Penny more to blame for their dispute; yet many formed a poor impression of Austin’s leadership and of his treatment of Penny. 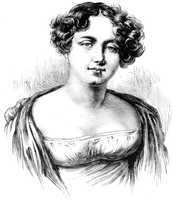 One of his senior officers, Sherard Osborn, sided openly with Penny, as did Lady Franklin [Jane Griffin*]. 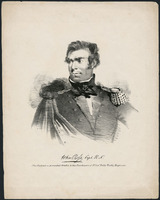 Moreover, George McDougall, second master of Resolute, spoke of Austin’s many mistakes during the voyage and mentioned that because Austin talked of individual officers with others few of the officers were willing to serve under him again. Austin at least considered continuing in Arctic service, but he took no further part in the search. 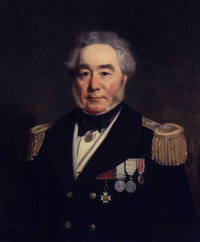 In 1852 he was made superintendent of the packet service at Southampton and in October 1854 superintendent of Deptford Dockyard, a position he held until he was promoted rear-admiral on 28 Nov. 1857. He was superintendent of Malta Dockyard from 6 April 1863 to 26 Nov. 1864. He was promoted vice-admiral on 20 Oct. 1864, and was made a kcb on 28 March 1865, eight months before his death. Scott Polar Research Institute (Cambridge, Eng. ), ms 116/57/1–9 (nine letters from Sherard Osborn to William Penny, 1850–52); ms 248/241 (journal of Sophia Cracroft, 12 Sept. 1851–28 Feb. 1852). G.B., Parl., Command paper, 1852, L, , pp.1–261, Arctic expeditions: report of the committee appointed by the lords commissioners of the Admiralty to inquire into and report on the recent Arctic expeditions in search of Sir John Franklin . . . ; L, , pp.269–670, Additional papers relative to the Arctic expedition under the orders of Captain Austin and Mr. William Penny. Sherard Osborn, Stray leaves from an Arctic journal; or, eighteen months in the polar regions, in search of Sir John Franklin’s expedition, in the years 1850–51 (London, 1852). O’Byrne, Naval biographical dictionary (1859–62), I, 30–31. C. R. Markham, Life of Admiral Sir Leopold McClintock (London, 1909), 71–77. 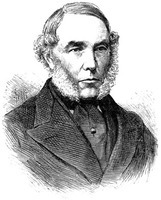 Clive A. Holland, “AUSTIN, Sir HORATIO THOMAS,” in Dictionary of Canadian Biography, vol. 9, University of Toronto/Université Laval, 2003–, accessed April 24, 2019, http://www.biographi.ca/en/bio/austin_horatio_thomas_9E.html.